Perth's Top Commercial Cleaning Company Since 1989. Castle Cleaning Service, a W.A. owned and operated business, has been one of Perth's top commercial cleaning companies since 1989. Over that time, they've built an enviable reputation for quality and efficiency and are well known for being able to get projects "over the line". For over 20 years, Castle Cleaning Service has been the trusted partner on some of WA's largest projects. Their expertise in cleaning offices, commercial fit outs, construction/building sites; and water damaged properties has seen them in high demand across the Perth metropolitan area. Attention to detail is critical in commercial cleaning and the Castle Cleaning team pride themselves on their impeccable cleaning quality which is always delivered on time. From initial scoping through to the actual cleaning and post project follow up, Castle Cleaning's customer service is second to none. Their management team are active in every project to ensure that clients are satisfied. 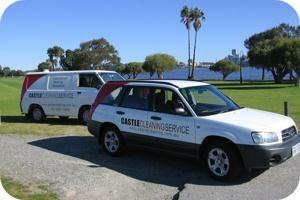 Castle Cleaning Service is commited to protecting its clients and staff from the hazards of cleaning. All necessary OH&S rules and regulations are strictly followed, and their teams come equipped with the leading equipment (checked and tagged regularly) and materials. All cleaning projects are backed by one of the industry's most comprehensive Public Liability policies. A cleaning job is only as good as the staff that do the work. All Castle Cleaning staff are carefully selected, go through a thorough training process and come with police clearances. Most ongoing cleaning projects are conducted by the same teams, as Castle Cleaning has one of the highest staff retention rates in the industry. Cleaning is often the critical last step in development projects. With a large team of cleaners and advanced scheduling software, Castle Cleaning can be as flexible as your project requires. Castle Cleaning offers an extensive range of cleaning services which can be tailored to meet your requirements. For more information about our services, contact us today!